Best School tuition Being updated with the school works and school homeworks of children are kind of challenge for parents in today's busy lives. 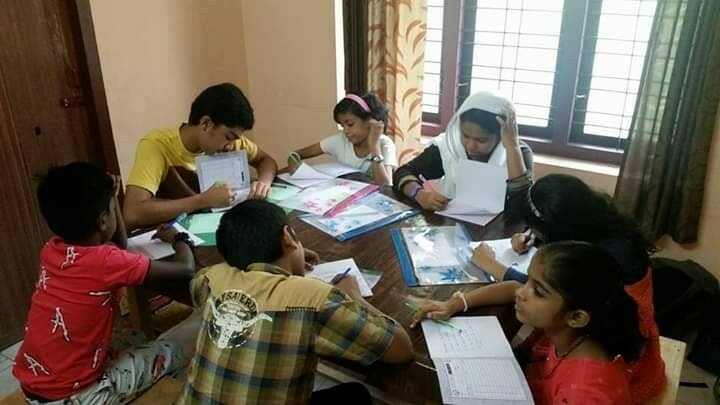 We take care of academics of children from class I to Class XII after School.We provide Tuition in subjects like Maths, Science, English , Hindi, Social studies for all the classes. CBSE/ ICSE/ IGCSE all boards are being handled by our Tutors and Subject Experts. Classes are conducted in small batches or One on One Individual sessions to give full attention to child's Learning requirements. What is IGCSE? IGCSE stands for International General Certificate of Secondary Education (IGCSE) Cambridge University. is an academically rigorous, internationally used, specialized, English language curriculum which is offered to students to prepare them for International Baccalaureate and CIE A-level. Because the Ruberics( Evaluation system) at IGCSE is complex and difficult to understand we rarely find good teachers and Tutors for the same. We have a set of Experienced Teachers who can teach IGCSE subjects quite well and we provide one on one individual attention to the child. We have both modes od operation for IGCSE classes, both classroom and online for IGCSE subjects. Math , Science, English, French, Hindi are some of the subjects covered by us. CBSE Tuition Let that be any class/ grade L.KG to XII. Children need assistance while they study CBSE Curriculum. We provide Classroom and Online tuitions in all subjects included in CBSE. Maths, Science, English, Hindi and Social studies are primary subjects of our focus. Our classroom tutoring involves teaching in small batches where one teacher handles only 4 -5 children that way we are able to give individual attention to each child's learning requirements. Other than the subject teaching our classes aslo focus on behavioural changes in children, good handwriting practices, development of Language Skills, career orientation, exam preparatuon. CBSE tuition We are one of the best centers providing tuition for school children in different subjects. Academics these days have become more challenging especially with the changing trends in evaluation and marking scheme. Children need Individual attention and an additional support to reach their Goals. We work with them on specific CBSE Model Question Papers, CBSE Worksheets to help them achieve best Results. Examinations are given special care and attention and special practice is done only for the examination. English Language Tuition CBSE/ ICSE/ STATE BOARD : Teaching and Learning English Language has become a challenge in today's world. We have subject experts who teach basics of English Language.Focus on Speaking , Reading , Writing and Listening. English Grammar, Vocabulary and Spelling are given special emphasis. English Speaking is compulsory within our premises and hence children get an opportunity to learn to speak english fluently. Individual and Small Batch Tuition Individual Tuition for classes 1 to 10 for all curriculum CBSE/ ICSE/ IGCSE /STATE BOARDS and all subjects Math, Science , English, Social studies, Hindi etc. are provided by us. We believe every child has his or her own learning pace and our mentors work with them based on their interests and make learning fun for them. Best Math Tuition in Calicut Mathematics is a very important and basic subject which the children are usually scared of. We are one of the best tutoring centers in Calicut as we have subject experts who have the skill to make the subject interesting and easy. They follow the patterns as followed by the school and bring in innovative ideas to make the understanding easy for the children. The teachers here work with the children at their pace and hence not putting any kind of pressure on children. Regular evaluation, monitoring and feedback helps us motivate the child to bring good results. Tutoring Center One of the best Tutoring Centers. We offer different courses for children of different age groups. We follow various curriculum like CBSE, ICSE, STATE BOARDS and other International Boards like IB, IGCSE etc. We have subject experts in almost all the subjects like Math, Science, Hindi, English, Malayalam. We focus not only on the academics but also on the overall Personality Development of the Children. Value Added courses with us include, Public Speaking, Creative Writing, Reading Club, Motivational Sessions, Spoken English, Career Orientation Etc.